Posted March 29, 2008 in 2008/03, Artists, Experts, Kirby, Jack, Odds & Ends, Topic, z Archive. Kirby colored every cover that he inked. 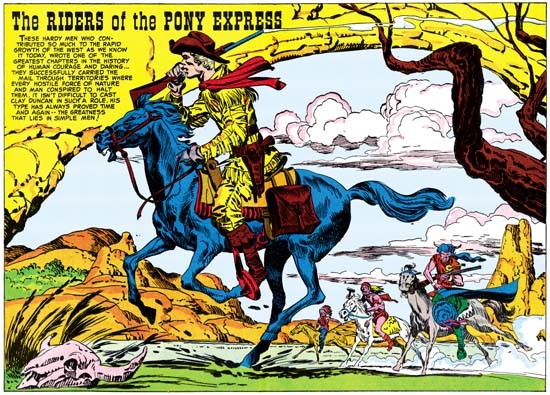 Kirby was the colorist for some of his Atlas work in Black Rider and the Yellow Claw. 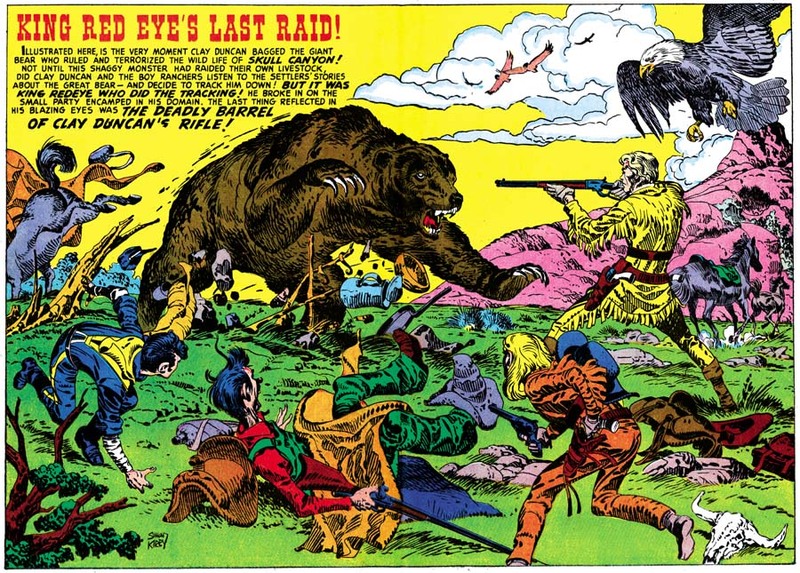 Kirby was the colorist for some of the Bulls-Eye reprints published by Super Comics in the 60’s. I believe Jack inked a lot of his covers and judging by some of the volumes of “The Complete Jack Kirby” Theakston believes that as well. I therefore find it hard to reconcile the first claim with Joe Simon’s comment in the recent interview with Jim Amash that “We didn’t do any coloring. Once in a while we’d make a color guide for cover art”. As for the second claim, this was from the period when Jack had started freelancing. Color guides were done on silverprints made from the original art. This was before Xerox and the other photocopiers provided cheap and quick copies. The logistics of Kirby bringing his art into the office, returning days later to pick up the silverprints, and then returning once again with the completed color guides, well it all seems too much effort for the lower rates offered to colorists as compared to pencils. The third claim is very puzzling. The Super Comics reprints of Bulls-eye were not colored the same as the originals. It seems absurd that Kirby would accept the very low rates Waldman had to offer to provide color guides at the time when Jack along with Stan Lee were creating the Marvel universe and he was getting much better page rates. That Theakston insists on these claims indicates that his methodology for determining Kirby Kolors is seriously flawed to say the least. How could it be possible to judge his other Kirby Kolor attributions where such independent evidence is not available? 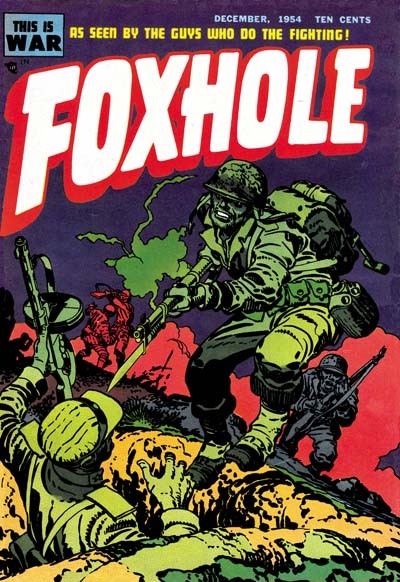 As I remarked in my previous post I feel there is a case to be made that four of the Foxhole covers may have been Kirby Kolors. Unfortunately those cover are so different from any other comics that I do not see a way to use them to help recognize any other coloring that Kirby may have done. Simon’s interview statement suggests that like many myths there may be a core of truth to Kirby Kolors. However I do not believe there is enough evidence from the Simon and Kirby period to provide guidance to that effort to find that truth. Evidence that my previous post’s theme of the canals of Mars indicates is required. Perhaps someday an intrepid scholar will be able to found a way around this conundrum but at this time it escapes me. Posted March 29, 2008 in 2008/03, 3 Timely, Artists, Assorted, Kirby, Jack, Odds & Ends, Periods, Simon, Joe, Topic, z Archive. As many of my readers probably already know, there is a lengthy interview of Joe Simon conducted by Jim Amash in the latest issue of Alter Ego (#76). I am sure it is the longest Simon interview ever published and it is filled with information that Joe has never previously revealed. In short it is the best Joe Simon interview ever, by a long shot. What I particularly appreciate is how Amash has managed to reveal the real Joe Simon, at least as I know him. Joe is a natural and entertaining story teller and that is a side no other interviewer has ever managed to bring out. My hat is off to Jim Amash, great job! The interview is accompanied by lots of great art, although on that subject I am certainly biased. Long time readers of this blog will already have been familiar with some of it but it is nice to see even those in print. There is an image I would like to comment on, one from the Captain America #1 described as “a photocopy of the original art”. Technically that is a completely accurate description, but nonetheless I fear that it might be misleading. I wish I could say that Joe still had any original art from Cap #1; it would be quite valuable today. I am pretty confident that all the actual art from Captain America #1 has been forever lost. The source of the Alter Ego image was a flat that Joe did save. The term flat may confuse some because Joe uses it in the interview as a name for magazines printed on non-glossy paper. In the context that I am using it now, a flat is a proof made during the construction of a comic. It is an image of four pages of the comic book arranged as they will be printed on a single sheet of paper. The images of each of the four pages were made from the original art without any colors. As such, flats are the next best thing to the long perished original art. Obviously both Joe and Jack must have known that there was something special about Captain America #1 because they both saved flats from that issue and that issue alone. 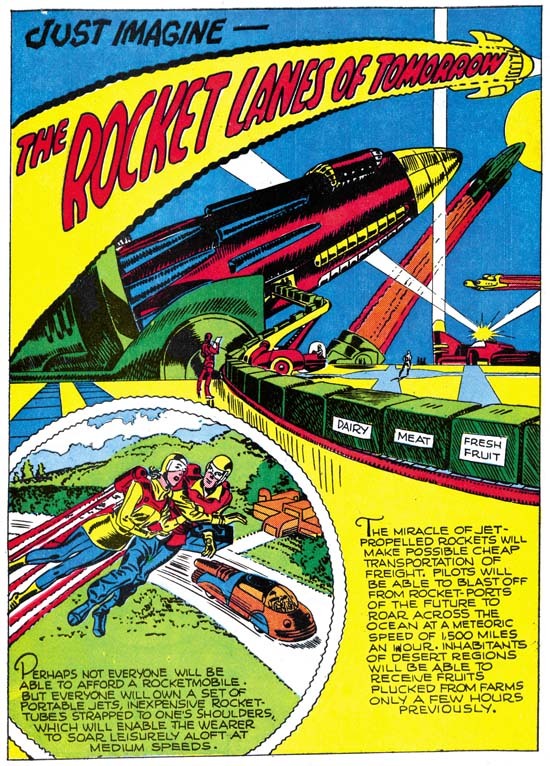 Joe’s collection does not contain any other flats until some of those published in making Mainline comics (from 1954). In the sixties Jack sold his Cap #1 flats to Marvel for use in their reprint “Captain America, the Classic Years.” Those flats have been the basis for all the reprints Marvel has made since of the first issue of Captain America. Since modern printing technology is much superior to that used at the time for publishing Captain America #1, you can see better reproductions of the line art by purchasing one of Marvel’s reprint today then you would get by spending thousands of dollars for an original issue. Posted March 21, 2008 in 2008/03, 5 Studio, Artists, Harvey, Meskin, Mort, Periods, z Archive. As discussed in my last post, an artist approached Al Harvey saying that he had figured out a way to make 3-D comics. With this process Harvey comics would produce 3-D Dolly, Funny 3-D, Adventures in 3-D and True 3D and Captain 3-D. The first two belonged to the funny animal genre intended for a very young audience while the next two were non-superhero adventure comics. Unfortunately for Harvey it turned out that the artist had not figured out the 3D process himself as he claimed but instead picked it up while he had worked for St. John Publications. I am not at all sure whether St. John had sufficient reason to legally complain but complain he did. The process St. John used was originally developed by Joe Kurbert, Norman Maurer and Lenny Maurer (the last two are brothers) having previously seen some European magazines with 3-D photos. However when they sought a patent they found that someone else had previously applied for one. Without a patent I just do not believe that they had any legal recourse against Harvey. To complicate things further, the original patent became involved in a court case between Bill Gaines (EC) and St. John. Probably none of the legal questions mattered much to Al Harvey because it turned out that 3D comics were not so much a craze as a fad. 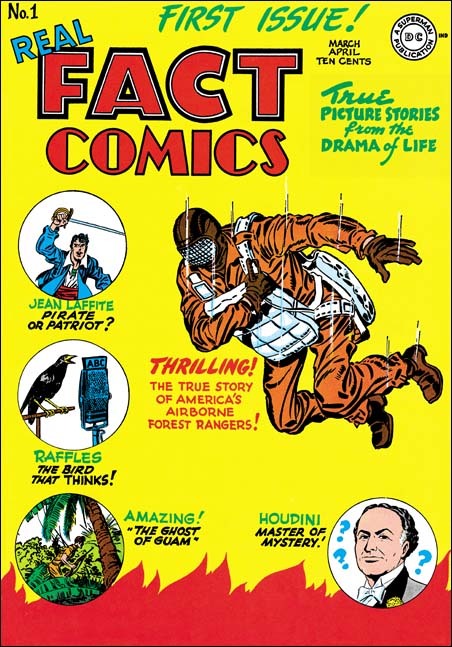 The very first 3-D comics were big sellers but sales dramatically dropped after the initial issues. Faced with disappointing sales and the legal questions, Al Harvey discontinued publishing further 3D comics. 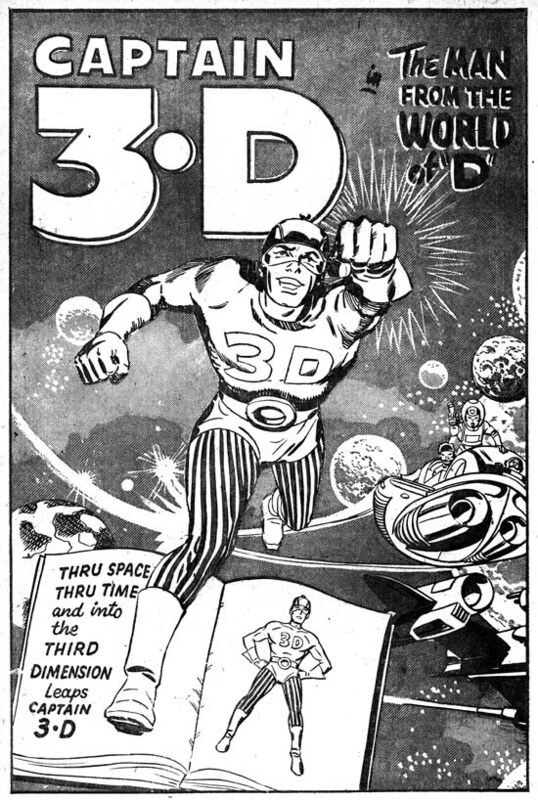 The cancellation of 3D comic titles was sudden but work had already begun on Captain 3-D #2. We know Jack Kirby had completed a cover because it shows up in an advertisement in Adventures in 3-D. 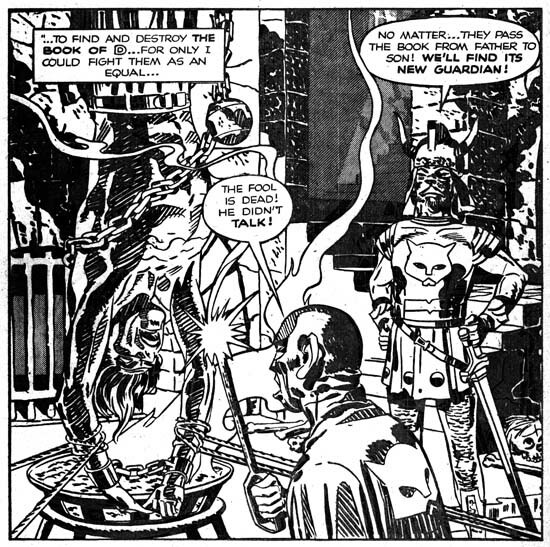 The cover was based on a nine paged story that had been drawn by Mort Meskin but remained uninked. I believe the story was already penciled when Jack did the cover because the cover is derived from a panel on the last page. Unfortunately the title for the story was not provided on the surviving pages of art. The inking would have been done on several layers of acetate. 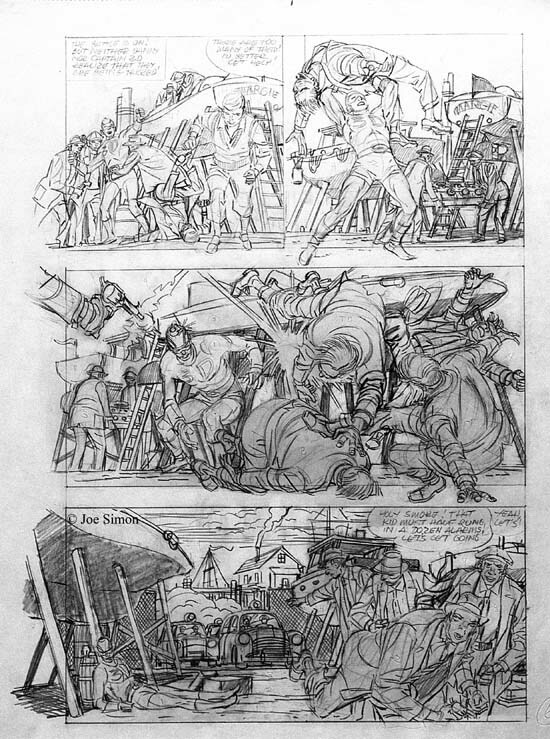 The splash panel of the first page already had pencil markings indicating how parts of the image were to be distributed on the different acetate layers. The markings are numerical from 1 (deepest) to 4 (closest) and the letter ‘B’. The ‘B’ layer was where the panel borders would be placed. For some reason there are no marking for layer 3, perhaps it would be the same layer as ‘B’. The layer markings are only found in the splash panel and not on the two story panels from the same page or from any of the other pages in the story. Presumably that was as far the process had gotten when the cancellation was announced. Perhaps a short discussion about a few of the technical aspects of 3D comics would be in order here. The 3-D glasses have a different color filter over each eye and the comics are printed in two different colors. The result is that each eye only sees the art printed in one of the two colors. As mentioned previously the original art is inked on acetate. These layers are shifted sideways in relationship to each other when preparing the different color printing plates. The layer of acetate representing the closest plane would be shifted the most while more distant layers would be shifted less. The result is that the art printed by the two colors is not identical and when viewed through the 3-D glasses provide the sensation of depth. To prevent the shifting planes of one panel from interfering with another, a wider then normal gutter is provided between panels. 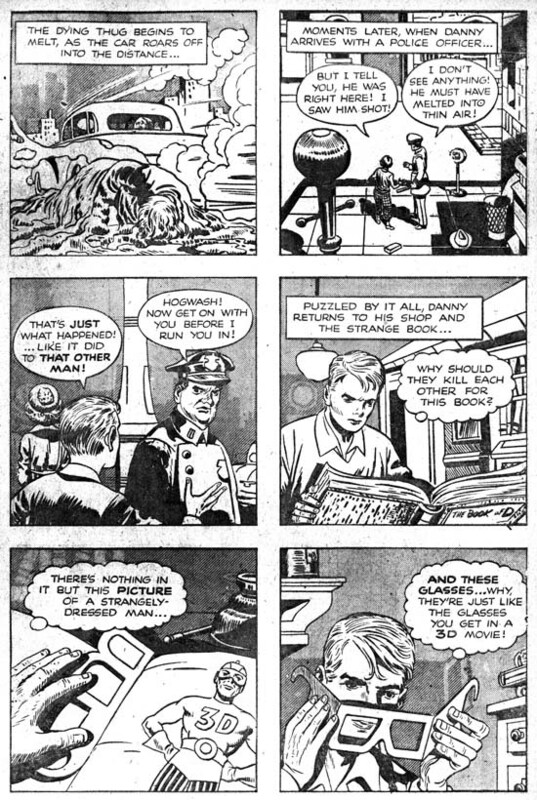 To account for the sideways shifting of the acetate every panel that Meskin drew in this story has an image then extents outside the panel on the left. That was an artifact of the process and would not be seen in the final printed comic. Because the process involves shifting the acetate layers only sideways most art in Meskin’s story do not extend beyond the top or bottom margins of the panels. There are many panels however where some of the art does go beyond the lower panel edge. This is not an artifact as it was meant to be seen in the printed comic providing an even greater sense of depth. 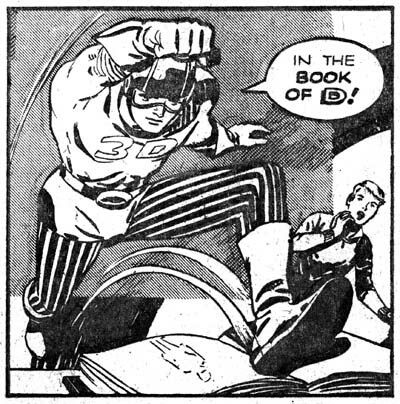 Surprising this technique was not used in Captain 3-D #1 despite the fact that Jack Kirby had used it in regular comics such as Captain America. Mort Meskin’s talent has largely been ignored in recent years. In 2006 Meskin was nominated for Eisner Hall of Fame but failed to be voted in. While some fans still appreciate the comics he did during the war most dismiss the work that Mort did for Simon and Kirby and afterwards. However it was not Meskin’s talent that changed but rather the type of stories that he worked on. The crime, romance and horror genre that dominated Mort’s later years just did not call for the same story depictions that his earlier superhero provided. 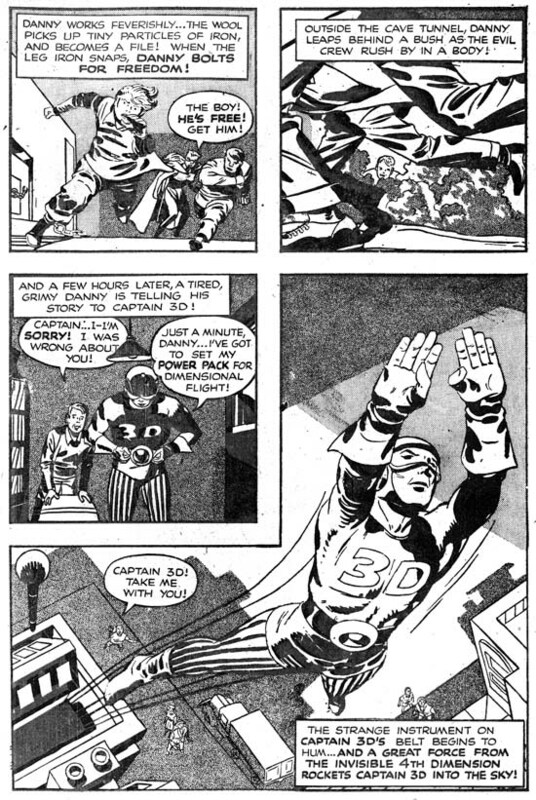 This Captain 3-D story by Meskin shows that not only could he still do superheroes, he was probably better at it then he had ever been before. Mort’s handling of action is just superb as is his control of perspective which is very important for a 3-D comic. It is very informative to compare Mort’s perspective with that used by Jack. Kirby is a master at perspective but a comparison with Meskin’s work highlights just how artificial Jack’s was. This is not a criticism of Kirby, far from it. Jack’s distortions of perspective gave his art an impact that I have never seen with any other comic book artist. While not possessing Jack’s exaggerated perspective, Meskin’s more natural approach is still more exciting then any other artist I can think of. It is a pity that issue #2 was never published. Who knows perhaps Meskin’s later career may have been different. In Golden-Age Men of Mystery #15 Bill Black quotes Greg Theakston’s tale of showing copies of Meskin’s Captain 3-D story to Steve Ditko. Ditko’s reaction leaves little doubt as to how highly Meskin was in Steve’s esteem. 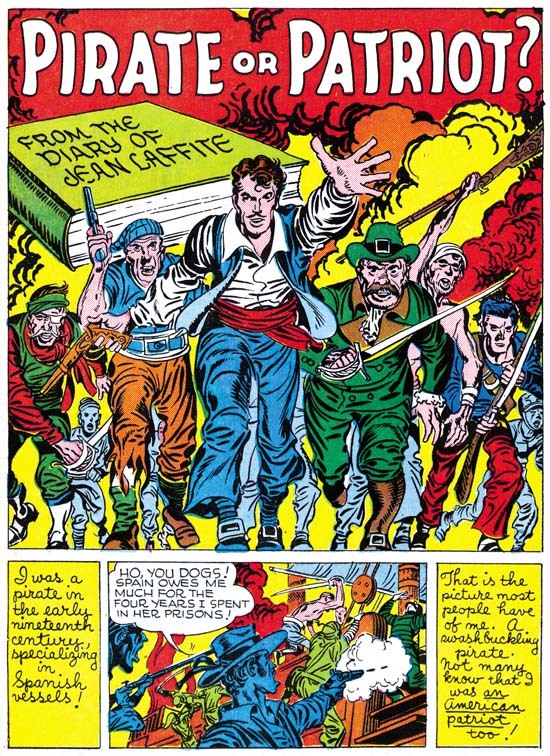 I am not surprised because I have always felt that Mort Meskin had a large influence on Ditko’s art. 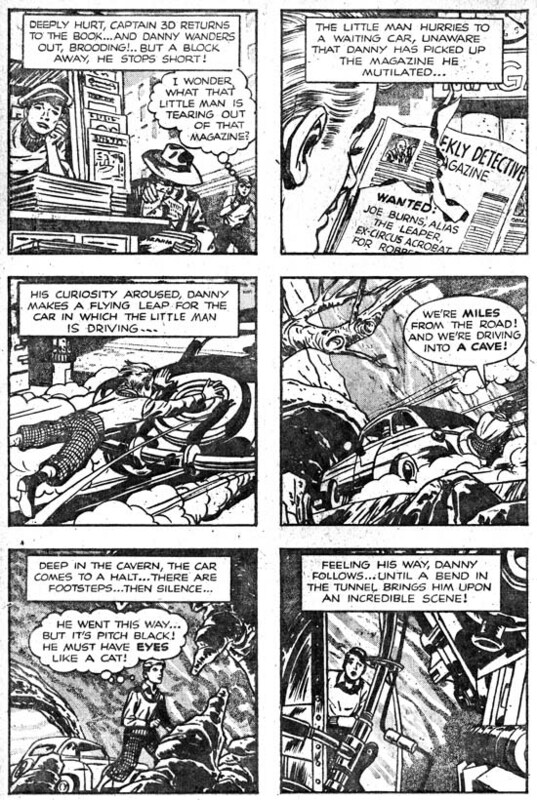 Most of the art for Meskin story can be found in Golden-Age Men of Mystery #15 (only the first page is missing). I will provide a synopsis of the story in the comments section of this post so as not to spoil it for anyone who wants to check it out for themselves. The surprising thing about the story is how much it differs from those in Captain 3-D #1 or any other Simon and Kirby production. Nowhere in the story do we find the Book of D that Cap was supposed to spend his time when not fighting crime or the cat people. 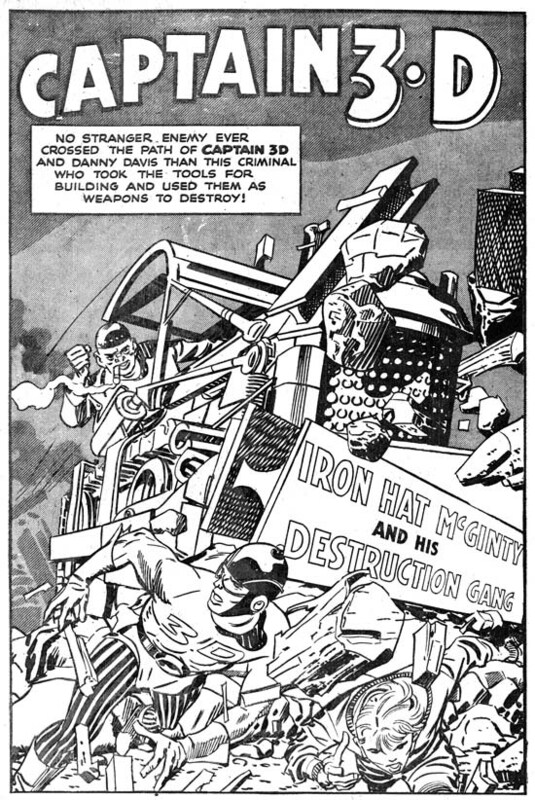 The story opens up with Captain 3-D and Denny in a cab! 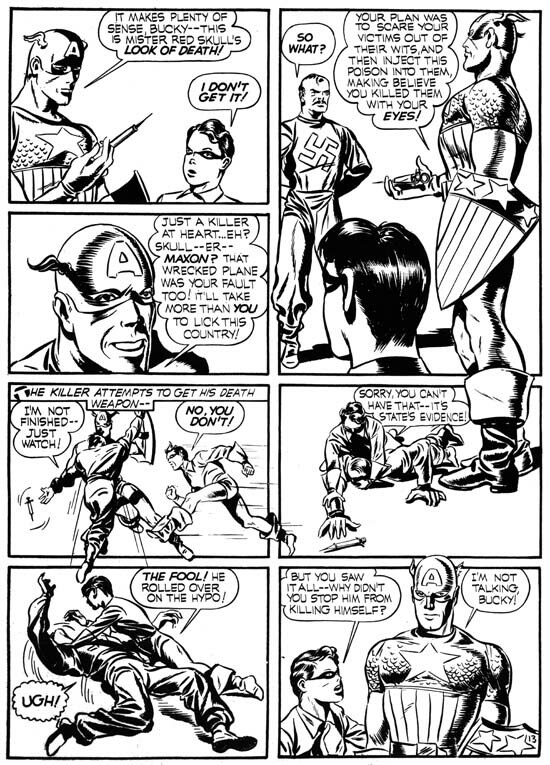 Cap enters a boat race to give someone a lesson; his conflict with criminals was an unexpected consequence. A new use of Captain 3-D’s power pack is revealed. The story ends with a type of humor not normally found in S&K productions. All of this convinces me that if Meskin did not write the script himself, he modified it substantially. 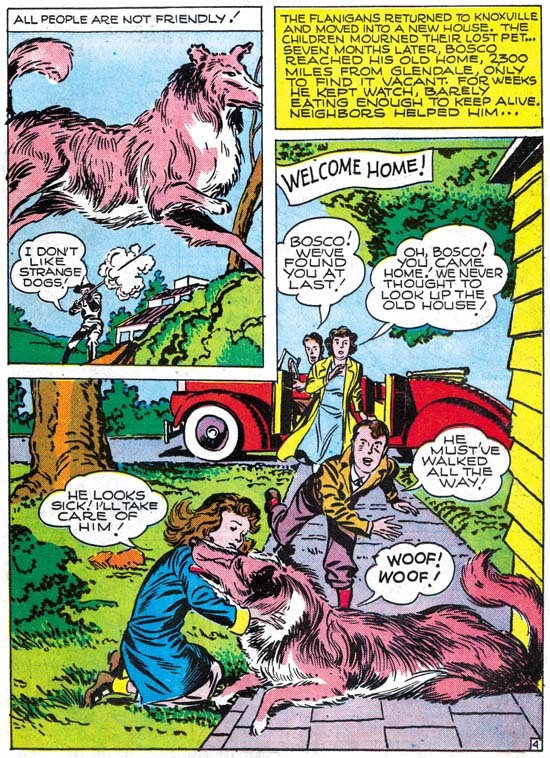 I have long considered that Kirby did this all the time, the romance stories Jack drew are very different then other artists in the same titles. However up to now I have never thought of Meskin doing this as well. Something I will keep in mind as I continue with my “Art of Romance” serial post. Posted March 18, 2008 in 2008/03, 5 Studio, Artists, Harvey, Kirby Inkers, Kirby, Jack, Meskin, Mort, Serial Posts, z Archive. Rand Hoppe has posted seven images of page 10 from “The Man from the World of D” story in the Jack Kirby Museum. This page inked by Mort Meskin includes the large panel that I feel is the masterpiece of the book. It is really great to see how the images were distributed over the different acetate layers. It is definately worth of visit to the Jack Kirby Museum, then again the Museum is always worth a visit! PS. I had a little trouble going from page to page using the “next” link but found that if I first choose the “full size” link first before using the “next” it worked. Posted March 16, 2008 in 2008/03, Uncategorized, z Archive. I am happy to report that Joe Simon will appear at the New York Comic Con on Saturday, April 19. Joe will be at the Abrams booth signing Mark Evanier’s new book “Kirby King of Comics”. The last convention that Joe has attended was the 2006 Comic Con. The contest is over, so if you have not received my email (or if your initials are not GS) I am sorry to say you did not win. Please do not be discouraged, the number of contestants that respond to my contests are surprisingly small so those who do enter have good odds. Posted March 8, 2008 in 2008/03, Artists, Experts, Kirby, Jack, Odds & Ends, Topic, z Archive. Giovanni Virginio Schiaparelli, an Italian astronomer and a careful observer, drew maps of Mars in the early 20th century. Surprisingly they showed straight lines crossing the surface. Later the American Percival Lowell repeated and improved on Schiaparelli’s observations. These linear lines were called canals. Some used the term just as a convenience while others felt that they really were artificial water conduits. The maps these scientists drew would be used in textbooks until the robotic probes arrived to provide high resolution photographs. These photographs showed that not only were there no artificial canals on Mars, the linear features mapped by Schiaparelli and Lowell could not be found at all. When prehistoric cave wall paintings were discovered in France and Spain they posed a significant dating problem. Because they existed on walls, the usual dating techniques of archeologists could not be applied. After much study, some scientists proposed a relative chronology based on the art style. Basically crude paintings and engravings were considered the oldest remains, paintings only using black followed, and then color art with more complicate perspectives were considered as done in the final period. Not everyone agreed with the proposal, but to most scientists it seemed very reasonable. However in the 1990’s some new caves were discovered which could be dated accurately. The art made use of color and perspective that by the old scheme would have put it in the final period. Surprising the dating showed the art was created from a very early period instead. I could provide further examples where reputable experts have made observations that in the end were shown to be completely false. You would think that experts would dispel false claims, not generate them. What gives? Humans, and that includes experts, have an amazing ability to recognize patterns. No computer has ever been able to match man in this capability. Unfortunately there is one important flaw in our skill; we find patterns even when none exist. This has been scientifically demonstrated over and over. People will find patterns in randomly generated numbers, or even flips of a coin. People are particularly susceptible to false patterns when they already suspect they are there. This is why Percival Lowell was able to “confirm” Giovanni Schiaparelli’s Martian canals. Experts are as prone to this difficulty as anyone else. But how can one distinguish between valid patterns and false ones? What is needed is independent evidence. Without such evidence, all “observed” patterns should be treated with skepticism. It is just that sort of skepticism that is called for on the subject of Kirby Kolors. This is a belief, shared by a surprising number of experts, that they can identify those stories and covers where Jack Kirby was the colorist. To date none of these experts have ever offered anything to back up their claims. The only justification advanced was the numerous works by Kirby they had studied. The only explanation as to what they looked for was vague talk of some colors such as salmon that Jack is said to have preferred. In order to dispel these mysteries and arrive at an understanding of the true nature of Kirby Kolors, it is best to begin with a review of how comic book colors were created in those days. Comics, just like almost all color publications, were printed using CMYK inks. CMYK stands for the colors used; Cyan, Magenta, Yellow and blacK. Combining different amounts of these inks can provide a very wide range of colors. Inks are actually printed as pure colors but the perception of gradients is created by printing small dots that cover varying amounts of the paper. At that time comic books were printed on rather primitive presses where the low printing costs were more important then color accuracy. Therefore most coloring was done using fixed measures for each of the CMY inks; 0%, 25%, 50% and 100%. Theoretically it would be possible to include 75% as well but that measure was rarely used for comic book publication, I suspect that with the crude printing presses it would frequently fill in and become indistinguishable from 100%. Note that I indicated the comic color palette was formed by three inks (CMY) and I did not include K. Black is theoretically redundant; it can be made by using 100% of the three other inks (CMY). However inks are not perfect; mixing CMY inks does not usually create a rich black so a separate black ink is generally used instead. The black ink could also be used in the three different gradients but doing so does not actually generate any new colors since the various grays that are formed can also made with gradients of CMY inks. With three basic inks (CMY) and four gradients (0%, 25%, 50%, 100%) it is possible to create at most 48 distinct colors. Actually colorists usually did not use the entire palette, some would be considered too muddy. Ted Klein has a blog entry showing what he used to use for his coloring work. What is important is that the comic book colorist had a very limited set of colors to choose from. With all the comics that the abundant colorists worked on, there is can be no doubt that every color in the comic palette would have been used by numerous colorists. Pick any color from an old comics and a careful search through enough comics will show that a single artist would not likely be responsible for all of that color’s use. The idea that Kirby’s color guides can be identified by the use of salmon (50% Magenta) makes no sense. Salmon color can be found in a number of comics that Jack Kirby had no involvement with. Chess has a small number of pieces yet they can be used to produce an incredible number of possible games. It is not a perfect analogy, but it does suggest that rather then trying to use a single color to identify a colorist you might be able to do so by identifying how different combinations of colors are employed. The more combinations that are used the more likely you could uniquely identify a colorist. The trick then becomes attaching certain color patterns to a particular artist. Unfortunately throughout the period of the Simon and Kirby collaboration comics did not provide credits identifying any of the colorist. Even afterwards when credits became more common, Jack Kirby was never identified as the colorist for any published comic book work. For such a prolific artist, there are surprisingly small numbers of colored works by Kirby. Most of the coloring Kirby did was for proposals and not actual comics and came after better printing methods were adopted and the older limited comic palette was abandoned. Joe Simon did do a lot of color work for the covers of Sick, however those covers were printed with the better printing presses used for standard magazines and therefore were not based on color guides nor did they use the limited comic book color palette. Since there are no comic credits or color guides examples that can provide support of the Kirby Kolor notion, what about evidence provided by people who worked with Jack? Well there is such evidence but it is not supportive of this myth. Joe Simon has stated that in the deal Simon and Kirby struck with Prize Comics, they were responsible for putting together all the art of a comic and it was up to Prize to do handling the publication aspect. When asked about who did the color guides, Joe would always answer that was the publisher’s job. This means that all the financial burdens of producing the comic art fell on Joe and Jack. Simon and Kirby would only recover their expenses by their share of the profits when the issue was released. Under this arrangement the idea that Jack would proceed to create color guides without getting paid for it seems a bit ludicrous. 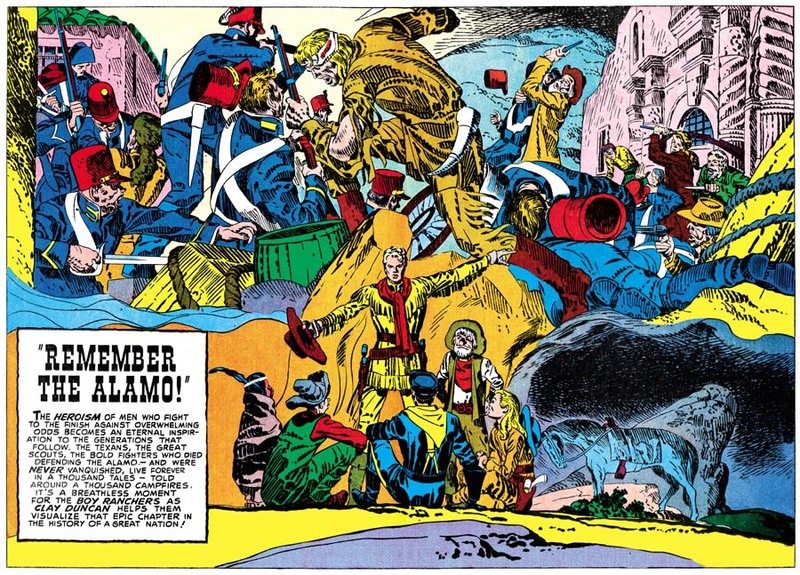 Most of what Simon and Kirby did after the war was for Prize comics, but not all of the it. Of particular interest for Kirby Kolors are the comics published by Mainline. Mainline was Joe and Jack’s own comic company and therefore at some level they were responsible for having color guides made. That is not to say Joe or Jack personally created the color guides, if Joe’s attitude about coloring is any example they probably handed this task to someone else. Simon’s collection still has a few color guides for some stories from a later period. When I asked him if he had done the coloring Joe replied that although he might at times color a cover he would never do so for a story. 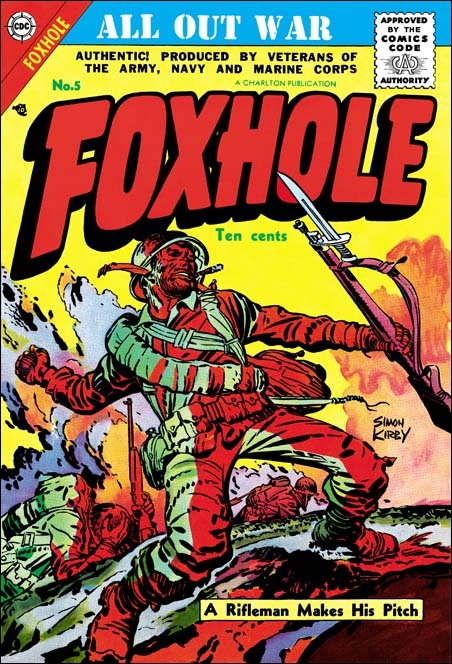 This remark has particular interest because of four extraordinary covers for Foxhole, a title started by Mainline and finished by Charlton. The coloring used on these four covers are very unusual, I do not recall every seeing anything like them elsewhere. Although the line art is incredible, the coloring plays an important part of what makes these four covers so successful. 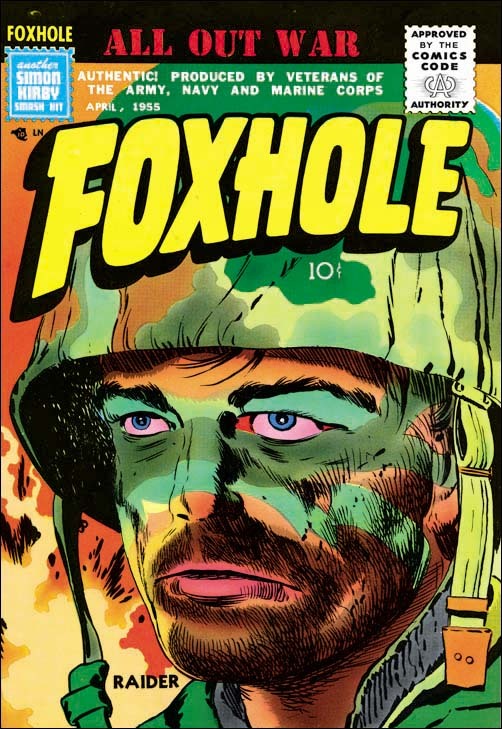 The Foxhole cover coloring is so good that one could suspect that they were not done by any ordinary colorist but could be the work of either Jack or Joe. These are the only examples where the myth of Kirby Kolors may have some validity, even then only if the bias is adopted that if it was artistically good Jack must have done it. Considering how much color work Joe has done later in his career and how little Jack did, this does not seem like a reasonable assumption. 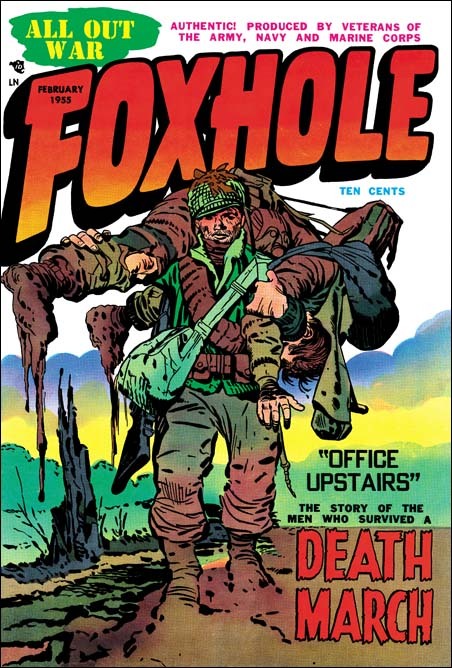 Even so, acceptance of the Foxhole covers as Kirby Kolors would not form the foundation for finding other examples, the dramatic coloring of the covers are not found anywhere else in the Simon and Kirby oeuvre, including the Foxhole interior stories. I am not naive enough to believe that this post means the end of Kirby Kolors. Kirby fans are so enthusiastic that some want to credit Jack with whatever successes they can. Fans find support for these efforts from comic book experts. The experts in turn are so absorbed in finding connections and patterns in comic books that they fail to recognize the lesson of the canals of Mars.